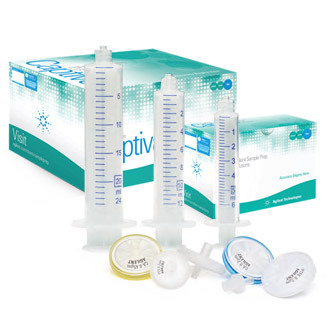 GET 1 FREE* PACK OF SYRINGES when you buy 2 packs of Agilent Captiva Premium Syringe Filters (100/pk). Use promotion code 9154 when purchasing directly from Agilent. Limit of five free packs of syringes per order. To account for the price of the syringes, the customer will receive a 15% discount on the purchase of syringe filters plus the syringes. Offer expires May 15, 2014. Buy 5 or more: save 40%. Promo code 9176. Offer expires Apr 25, 2014. Terms and conditions apply. Purchase any LC column method development kit (3-pack) and receive a 25% discount. Promo code 9212. Leaky GC or GCMS column connections are a productivity drain, creating high background noise, poor peak shapes, shorter column lifetimes, and increased detector maintenance. Maintaining a leak-free GC or GC/MS system is critical for obtaining optimal system performance with reliable, reproducible, and accurate results. Now, put an end to the frustration around leaking GC column connections. 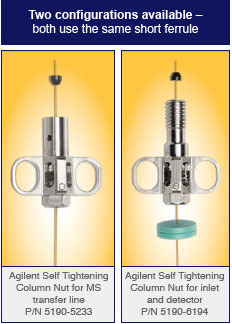 Agilent’s NEW Self Tightening Column nuts provide GC and GCMS with long lasting, leak-free GC column connections -- without a need to retighten – so they can maximize the performance and productivity of your systems.